Whooaa, thanks for all the pics and the clips! Pure awesomeness! It was bizarre, Ogre came on stage, subtly convulsing and supporting himself with a walker, like what an elderly person would use. Then Love in Vein started. Throughout the show, he peeled away masks and faces. The first one was very aged, the second was a horror mask, and the third was a weird mix of visceral tissue around his head, and the face was completely blacked out. Heavily thematic and well done show. There was one moment of complete hilarity when the stage tech. threw Ogre this cane/cross and he caught it perfectly, then Ugli came on and everything got kinda crazy. Periodically Ogre would run behind the glass chamber, and he'd be projected on 4 different screens, with the backing visuals coming up and he'd blend in with them. Morpheus Laughing / HateKill / Deadlines / Rodent / Assimilate / Love in Vein were highlights for me. That icy synth sequence in Morpheus really digs under your skin in a live context. Unnerving, almost. During Pedafly, I think there was a huge explosion of fake blood, because my friend who went with me was looking all around herself like something hit her. But after looking around, i noticed there were specks of blood everywhere, clothes, people's faces, but then again, we were up front. After looking at the stage everything made sense immediately. Ultimately, better going home with a bit of fake blood everywhere than flour, vx gas "phlegm", and mud like 2004. Hope they can get a EU tour together in 2010, they are always getting better. > "phlegm", and mud like 2004. HA! So in 2004 I was front row center and got pelted with all of the above. I had fake blood, applesauce, and flour *everywhere*: all over my clothes, in my hair, etc. Anyway, i had not literally ate or drank anything in 6 hours so on the way home from the concert i was dying of thirst and decided to stop at a gas station for water. Mind you it was, like, two in the morning. So i walk in and the gas station attendant stares at me in utter horror. I couldn't for the life of me figure out why until i realize ... i'm completely covered in blood. I had to quickly explain to him, "It's not real! I was at a concert!" Pretty funny, all things considered. Euro dates in case anyone did not see these! Not 100%, but more dates are here. Thanks alot for posting the dates. Their slots at the Mera Luna festival over the years are interesting. Going from headlining the main stage to playing the main stage at around 17:00 in the afternoon to co-headlining the second stage. Sad! Just giving a heads up, the 2009 In Solvent See tour was the best of all post-reunion tours. Whispers in certain circles are hinting that the Euro 2010 summer tour is going to be absolutely unreal. Tour starts in two days, they have many things up their sleeves this tour. 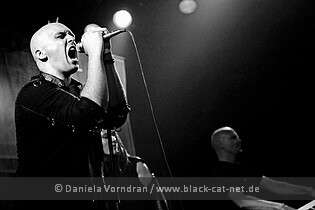 Will see them in Belgium at the Gothic Festival this weekend. First Front Line Assembly, then Skinny Puppy! What a package!! 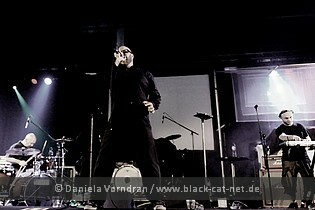 the pics of Gothic Fest on 30th July 2010 in Steenwijk / Netherlands are online at http://www.black-cat-net.de. 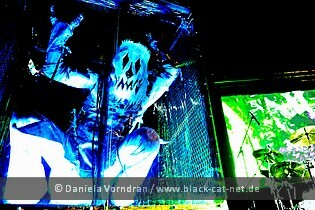 You'll find pics of Skinny Puppy, Mindless Faith, Destroid, Misery, Dismantled, The Chaos Industry, Angelspit and Contrast. Looking forward to see Skinny Puppy again this weekend at the M'era Luna festival. Two weeks ago in Waregem they were simply mindblowing, one of the best shows I have ever seen! Also looking forward to Nitzer Ebb and Laibach. And when The Sisters Of Mercy play in the fog I'll wear my Gothic Rock hat! New oHgr album landed. Good stuff!